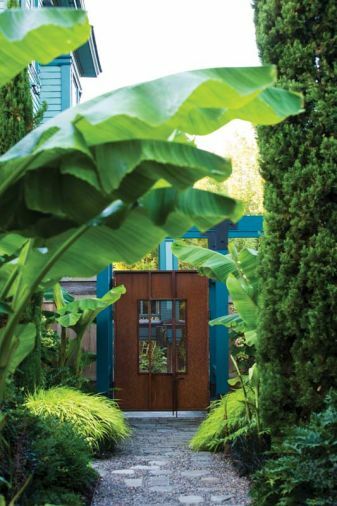 Lauren Hall-Behrens’ garden in Northeast Portland fuses modern industrial elements with a tropical vibe to create a lush retreat from urban life. 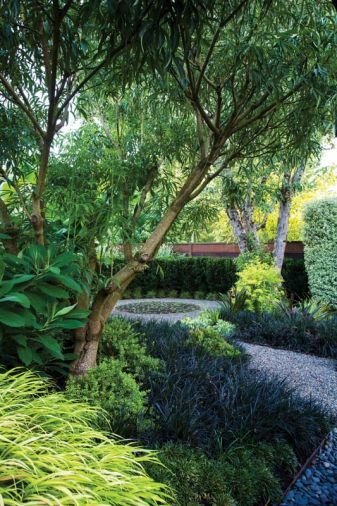 Strong vertical lines, a more than eight-foot-tall arbor, and plants with significant height create a screening effect from neighbors while linking the garden to the Hall-Behrens’ tall home. 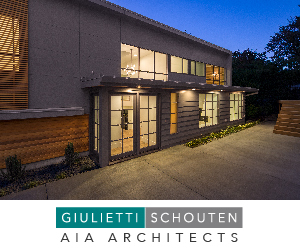 “I needed to step the house’s scale down, so that the garden became a part of the house architecturally, and contextualize the house into the landscape,” Lauren explains. Mature Japanese Banana (Musa basjoo) and Italian Cypress (Cupressus sempervirens ‘Glauca’) flank the garden’s entryway above soft stands of Japanese Forest Grass (Hakonechloa macra ‘All Gold’). 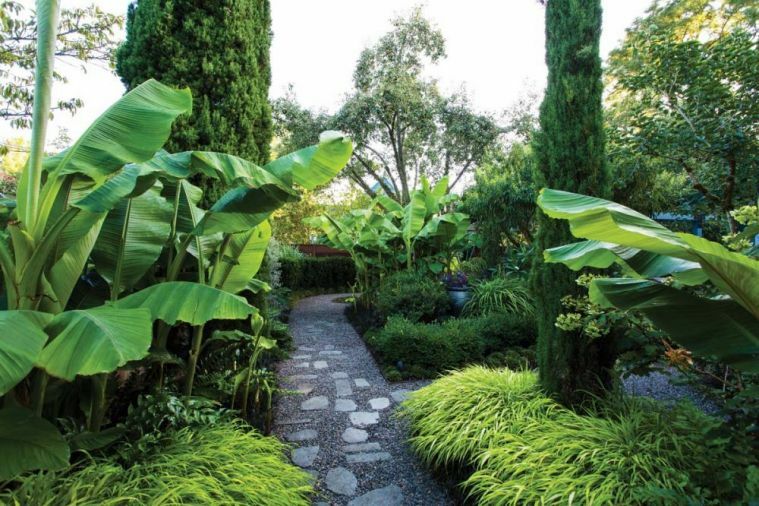 Lauren loves the drama and texture of plants with very large leaves, and chose banana as a way to create rhythmic patterns throughout the garden. As the summer progresses, the bananas get tall enough that they create an almost tunnel-like effect. Rusted steel is used frequently for garden hardware. 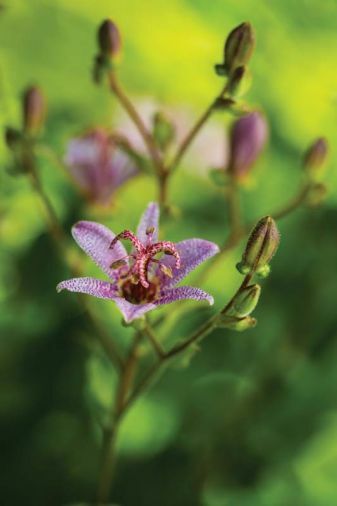 Though this garden is more about foliage than flowers, Toad Lily (Tricyrtis ‘Blushing Toad’) makes an appearance for its architectural lines and jewel-box like blossoms. The galvanized steel gazebo was made by Matt Proctor, a friend and metalworker who makes high-end electric guitars. Black Mondo Grass (Ophiopogon planiscapus ) is used as a groundcover throughout the garden. In the foreground, Metapanax delavayi offers a graceful vase-shape; in the background is an old apple tree retained from the previous garden. 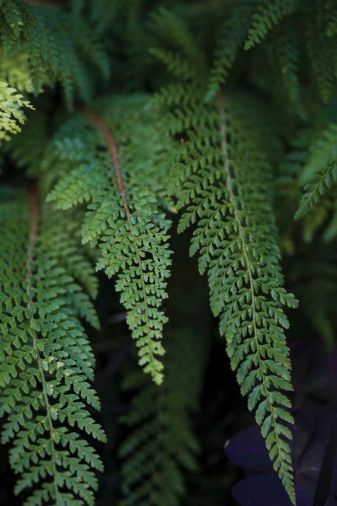 Ferns like Soft Shield Fern (Polystichum setiferum ‘Divisilobum’) add softness and movement. 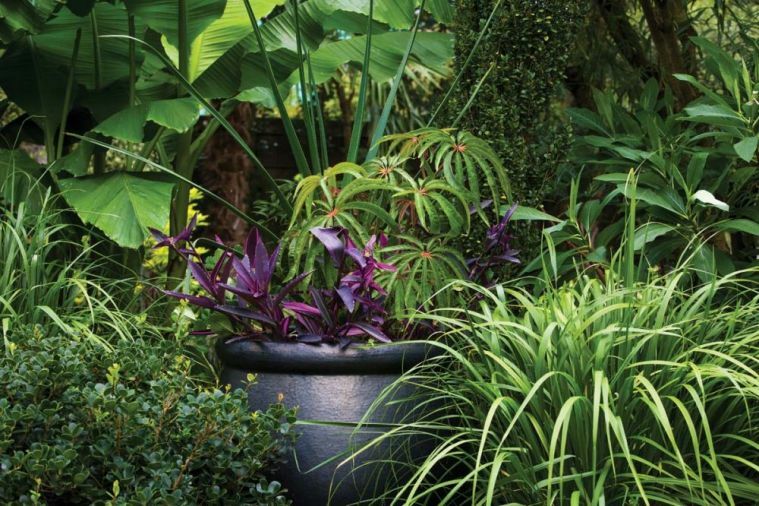 Pots are filled with annuals like Wandering Jew (Tradescantia pallida ‘Purple Heart’), Grass Aloe (Aloe cooperi), and Palm Leaf Begonia (Begonia luxurians). A water feature made from mossy rocks attracts birds and wildlife. 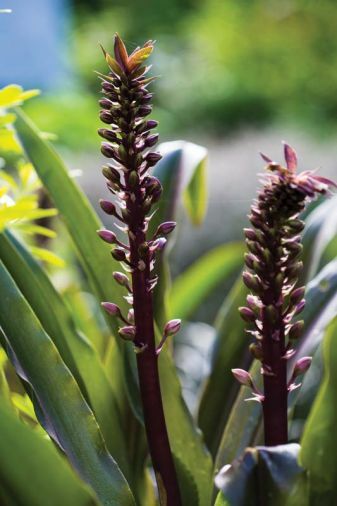 Annuals are confined to pots rather than planted in the ground in order to limit maintenance; Pineapple Lily (Eucomis ‘Sparkling Burgundy’) has strong architectural foliage as well as spiky flowers with a tropical appearance. 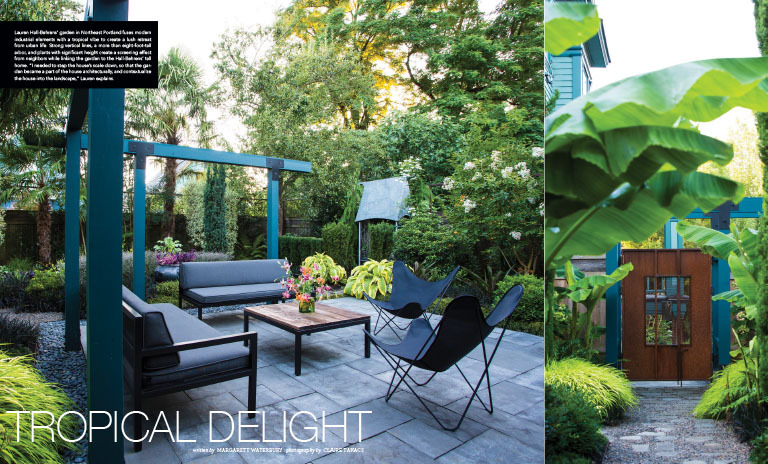 Although the Hall-Behrens’ home is in the city’s urban core, tall plantings enhance the feelings of privacy and sanctuary. Lauren relies on foliage rather than flowers for interest and texture, which keeps the garden looking lush longer. 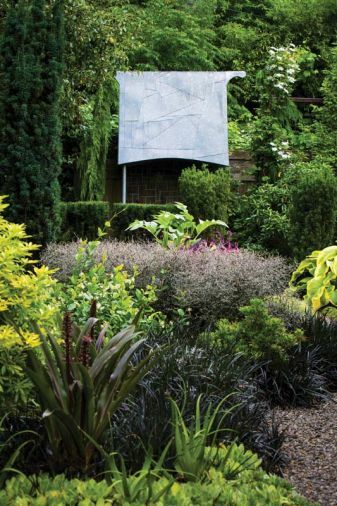 When landscape designer Lauren Hall-Behrens moved into her home in Northeast Portland in 2001, the garden was in rough shape. Elevated from the street by several feet, the back garden was weedy, disorganized, and full of unmaintained fruit trees. “It was a crazy scene,” Lauren laughs. 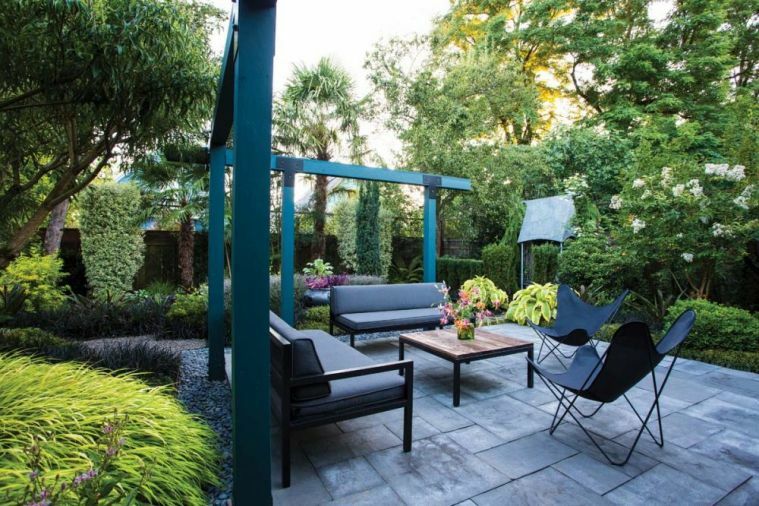 As the owner and principal of Lilyvilla Gardens, a Portland-based landscape design firm, she had the knowledge to transform her garden from a chore to an oasis – but it turns out that designing a garden for yourself is a lot harder than designing for a client. “As a designer, I get to see other people’s property through a beginner’s eye. I don’t have the attachment to the space that an owner does, so I can be more flexible. But when it’s your own garden, and you have attachment, that’s more difficult,” she says. For many years, Lauren used her property as more of a laboratory than a garden, adding, removing, and rearranging plants each year. “For a long time, I was just experimenting,” she says. “I kind of exhausted myself, but I learned so much.” Then, in 2010, she decided it was time to create something more permanent, so she ripped everything out for the last time and began to design a peaceful, low-maintenance urban retreat inspired by one of her favorite groups of plants: Asian tropicals. While developing the concepts for this garden, Lauren kept simplicity, relaxation, form, and rhythm at the forefront of her mind. 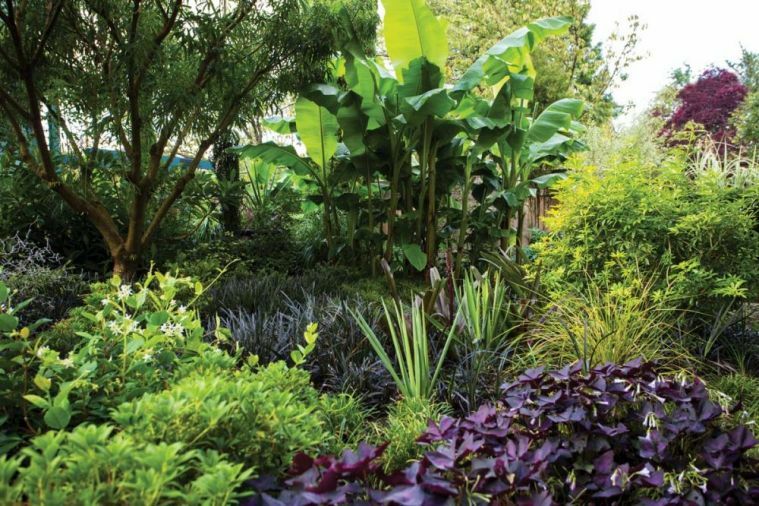 She says thinking about the functional role plants play in a garden – lengthening views, stopping views, hiding corners, or creating a sense of mystery – is essential. “I think structurally and functionally first, then form, then color,” she says. “I’m big into form, more so than flowers. I like to use broadleaf evergreens and coniferous evergreens as structural elements that bring architecture into the garden.” Evergreens like Pittosporum and various ferns are used in this garden to keep it looking lush and verdant, even during the winter months. 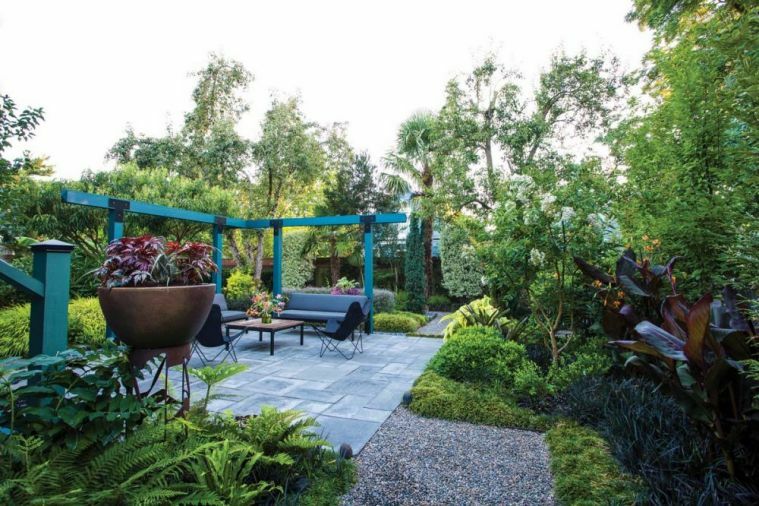 As in many of Lilyvilla’s projects, hardscaping also plays a major role in this garden. Lauren opted to keep the ground level to retain as much privacy as she could. 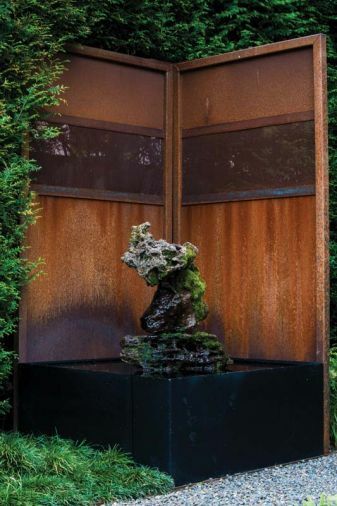 Many of the hardscaping elements, including the fence, gate and edging are made from rusted steel. 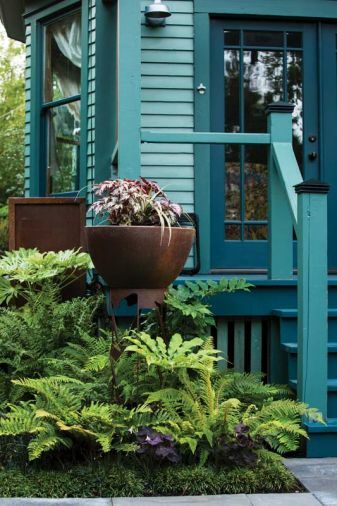 “I’m attracted to that color, and I think it contrasts nicely with the house and the plants,” she explains. When considering the hardscape design for her own garden, Lauren spent a lot of time considering the kind of experiences she wanted to have. At first, it seemed essential to add a dining area on her main patio, but the more she thought about it, the less important that element began to appear. “I realized I didn’t want what I thought I wanted. 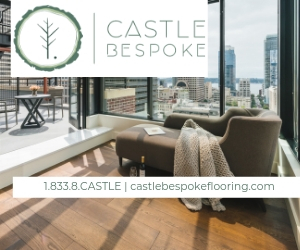 I just wanted to go out and lounge on something comfortable.” After struggling to find outdoor furniture she loved, she designed the two outdoor sofas herself, and commissioned a furniture maker to build them.